This is a wonderful and touching story about a spiritual visit to Grandma’s house. The author’s grandmother is ill and desires to move on and go to Heaven. This spiritual experience afforded the author an opportunity to visit and shower love on her grandmother. When I think of her the first thing I see is her smile with a long bright row of straight beautiful teeth. She speaks her mind and lets the chips fall. She loves baseball, card games, and romance novels. She is a caretaker. At forty-six she had the last of five children. Give her a cigarette, a cinnamon bun, a cup of coffee, and she is in Heaven. This wonderful woman is my grandma. At eighty-nine years old she has always weathered illness and bounced right back. Recently she was not feeling well and was talking about moving on from this life. She has been dreaming of fields of orchids. I have seen these fields too while visiting the Heavenly Worlds and I am certain that God is preparing her for the next adventure. She lives in another state twelve hours away, but on March 15, 2015 the Prophet read my heart and I found myself standing in the center of her familiar kitchen while my body sat here in Virginia. I was attending a class at the Nature Awareness School and we had just finished singing HU. My heart was filled with love. I sat in the quiet time afterwards listening for communication from God. My awareness drifted to my grandmother and in an instant the Prophet took me to her. I had many experiences at once, like a movie playing out, but better because I was not just seeing. I was there in the present time and also re-living some of my most fond visits with my grandma. The first thing I saw was her coffee pot and I could taste the salty coffee. We had a lot of laughs about this over the years. She had to soften her country water with salt. Then I saw the cookie jar that was almost always filled with homemade cookies. I felt my hand run along the orange counter tops. I could feel the wind blowing over the cornfields and through the screen door in the dining room. I smelled the light scent of manure from the farm down the road. I felt the quiet openness of the property and in the living room I saw my grandpa watching westerns in his recliner. I felt my face pressed against the brown shag carpet as a teenager on a particularity long holiday visit. Then I was a child again staying up late playing cards with grandma as she smoked cigarettes and told stories. I saw her making homemade noodles and a piece of ravioli being tossed into boiling water. Then I saw her sitting at the kitchen table. The Prophet stood behind her smiling. 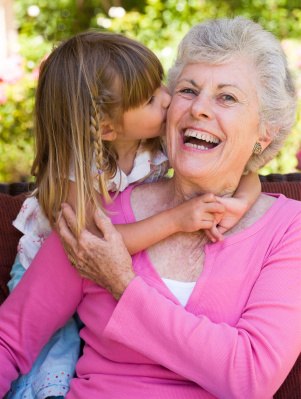 I cupped her face in my hands and said, “I love you, Grandma.” Then I was clapping for her. “Bravo!” I kept repeating. My heart swelled as I congratulated my grandma on a life well lived. It means everything to know that my grandma is in the care of the Prophet and that while her body is going through a rough time she is perfectly fine. I also got to love on her and appreciate all the beautiful ways she has touched my life. This was so much more than remembering. God allowed me to re-live these precious moments in time. Sometimes the “little things” that make up my daily life seem like they will happen forever, but nothing stays the same for long. These moments once passed become the “good times” of life. Thank you God, for reading my heart and taking me to see my grandma once again. Thank you for giving me peace to know that she is in your loving care. When I call her she is confused and does not want to talk for long. It means so much that we were able to communicate Soul to Soul and I could tell her how I really feel before she passes.